AUTHOR AND ADVOCATE G. B. TAKEN PROVIDES A REVEALING AND COMPREHENSIVE BOOK THAT ANYONE WITH A MORTGAGE NEEDS TO READ. 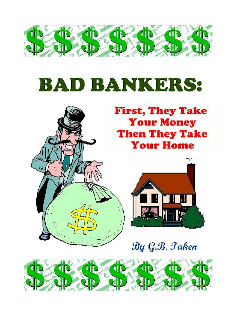 AS A VICTIM OF PREDATORY LENDING AND THEN LATER GETTING THE "INSIDE INFORMATION" FROM A FORMER LOAN BROKER, THE AUTHOR GIVES A UNIQUE PERSPECTIVE THAT WILL HELP YOU SAVE YOUR HOME AND STOP THE BANK FROM RUNNING OVER YOU. THIS IS A "HOW TO" ON FINDING OUT IF THERE IS SOMETHING WRONG WITH YOUR LOAN; AND YES A GREAT MAJORITY OF LOANS CONTAIN ELEMENTS THAT CAN HAVE A LOAN CANCELED OR RENEGOTIATED. LEARN WHY TO SUE YOUR BANK AND HOW TO DO IT. LEARN WHAT TO EXPECT THROUGHOUT THE PROCESS OF SAVING YOUR HOME.